Usually when we hear the story of NASA it starts with the Soviet Union launching Sputnick. It is not often anyone finds out more about NASA’s early days. This changed for me when I read Amy Shira Teitel’s book Breaking The Chains of Gravity: The Story of Spaceflight Before NASA. Originally known as NACA (National Advisory Committee for Aeronautics), Congress created the independent advisory agency in 1915 (2nd year of WWI) to monitor and urge on aircraft advancement. This act was passed because the United States lagged behind Europe in airplane technology and needed to catch up fast. The agency chairman was Brigadier General George Scriven, the chief of the Army’s Signal Corps. He led a committee of twelve members from the government, military, industry, and an executive committee with seven members chosen from the main committee, and a single employee John F. Victory. No one received payment. NACA’s advisory role did not last long. Within five years the agency expanded its role greatly. Among its advances included the creation of its first research and testing facility, the Langley Aeronautical Laboratory. The scientists and other employees developed missiles, improved aircraft and performed flight tests in a wind tunnel. The data collected from these test flights led to airfoil shapes for wings and propellers, simplified aircraft design and more. Many of these developments and improvements in design became a realty in many U.S. Aircraft of the time including the WWII aircraft the P-51 Mustang. While the U.S. air force benefited from NACA’s work in the minds of such people as Wernher von Braun, Hugh Dryden, Walter Dornberger and others the idea of using the same technology to reach space was another goal. Eventually the President and others in government wanted this as badly as NACA. 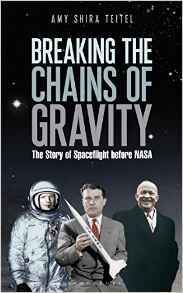 In the pages of Breaking The Chains of Gravity: The Story of Spaceflight Before NASA, it tells how these men and many others took what they developed and use it to launch a whole new field of technology, science, and more. The book kept me glued to its pages and enlightened me to an era of United States History that may not have been as exciting as what came later with NASA but is nevertheless just as important and valuable to know about.